Quinoa, Kale and Chickpea Salad – a delicious, protein-packed salad that is great for a healthy lunch, vegetarian main meal or side dish. I’ve frequently mentioned my love of quinoa. 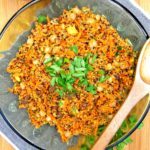 Quinoa is a complete protein, meaning it contains all eight essential amino acids, and I love it’s nutty taste and versatility. 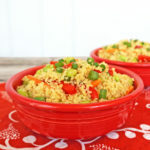 Quinoa is wonderful in salads such as Greek Quinoa Salad and Asian Quinoa Salad as well as baked dishes such as Spinach and Artichoke Quinoa Bake. 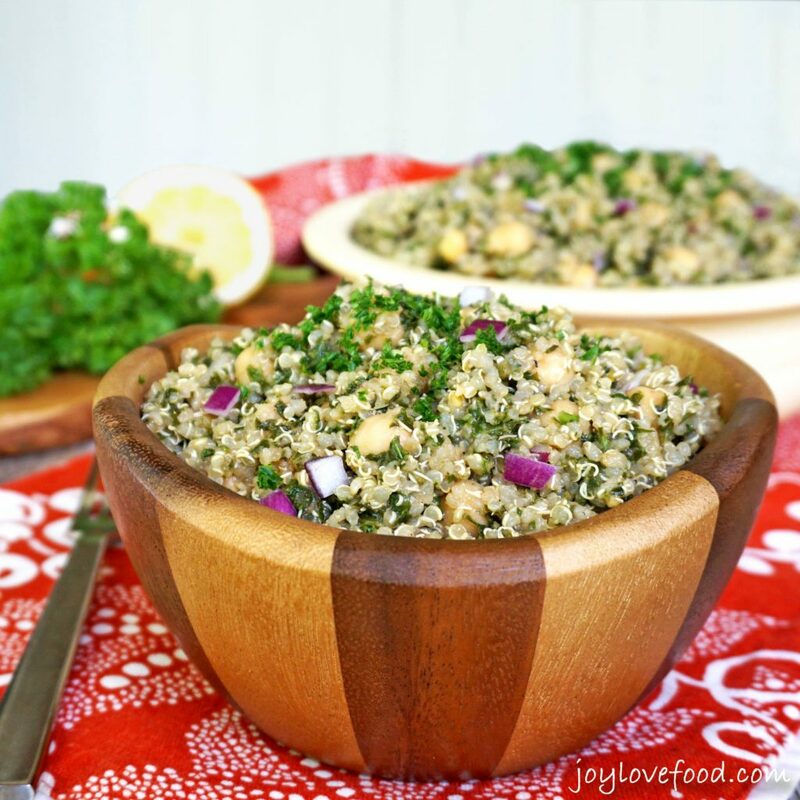 Today, I’m sharing another salad recipe, this Quinoa, Kale and Chickpea Salad, that contains another of my favorite superfoods – kale. I make this salad all the time. It was a wonderful accompaniment to this past Memorial’s Day weekend barbeques. I also often make it to have on hand for a healthy lunch or snack during the week. To make this Quinoa, Kale and Chickpea Salad, I first prepare the quinoa according to the package directions and finely chop the kale. Once the quinoa is cooked, I immediately stir in the kale so that the heat from the cooked quinoa wilts the kale a bit. Once the quinoa and kale mixture is cool, I add it to a large mixing bowl along with chickpeas, red onion and parsley and toss it all in a garlicky balsamic vinaigrette. I’ll often add in some raisins or dried cranberries and/or grated Parmesan cheese. The salad can be served immediately, or kept in the fridge for several days. 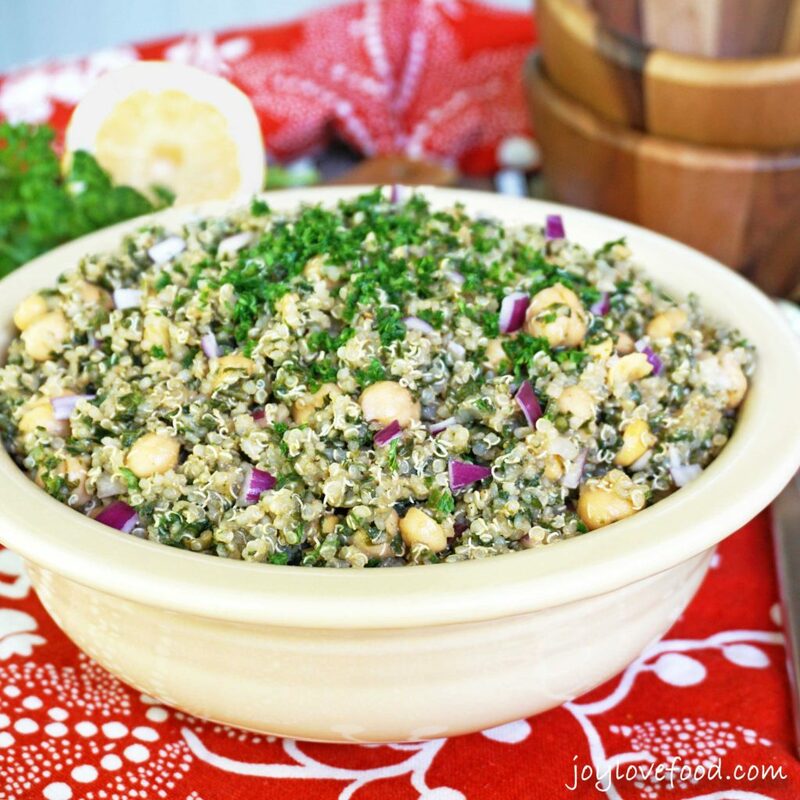 This protein-packed Quinoa, Kale and Chickpea Salad is a great side dish for a barbeque, it also wonderful for a healthy lunch or snack anytime. 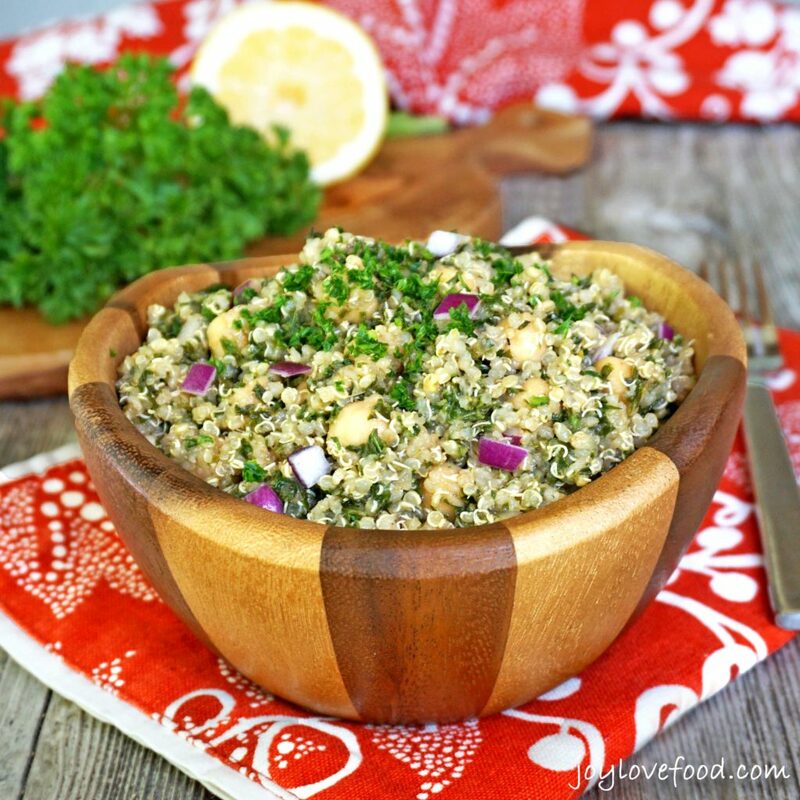 Quinoa, Kale and Chickpea Salad - a delicious, protein-packed salad that is great for a healthy lunch, vegetarian main meal or side dish. When quinoa is done cooking, immediately stir in chopped kale; set aside to cool. In a large bowl, whisk together the lemon juice, balsamic vinegar, olive oil and garlic. Add in the cooled quinoa and kale, chickpeas, parsley and red onion and toss to combine. Stir in raisins or dried cranberries and/or Parmesan cheese, if using, and season to taste with salt and freshly ground pepper. 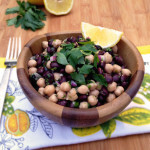 This entry was posted in Main Dishes, Salads & Sides, Vegetarian and tagged chickpeas, easy, gluten free, healthy, kale, lunch, quinoa, recipe, salad, side dish, vegan, vegetarian. Thank you Joy. I just made us for lunch and my family loves it. It was very refreshing. Hi, so glad you and your family enjoyed it! Joy this salad looks wonderful for our summer cookouts. 🙂 I love the wooden bowl you are serving this in, I was wondering if you could tell me where you pirchased it. Thnks Much. 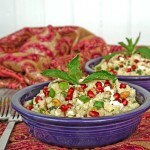 Thanks Dianne, it is indeed a great dish for a summer cookout! I will email you a link to where I purchased the bowls, we love them! I love the fresh ingredients in this dish! I have kale growing in my garden and always need something new and exciting to use it for. Thanks Michelle, hope you give it a try and enjoy! Perfect summer salad! I love eating salads as mains during summer! Woo Hoo! Love this one! Thank you so much for sharing! I’m looking forward to making this. Thanks Kelly, hope you give it a try and enjoy! Some of my favorite ingredients in one salad! 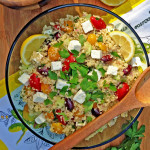 Such a great Summer salad! Pinning for later! This is one action packed salad. LOVE the dressing, too! This looks healthy and delicious, and I like that you added raisins and dried cranberries. I love this sweet and savory contrasts in salads. Thanks Hadia, the raisins and/or cranberries do add a nice touch of sweetness! This looks delicious. Healthy. And filling. 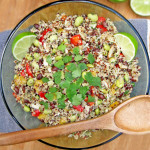 Thanks Mischelle, it is really good, and one of my go-tos for a healthy lunch or side! I made the dip from the last time! This one looks so enticing too. Yummy! Thanks Merlinda, so glad you tried the dip, hope you enjoyed! Thanks Steve, this one is definitely worth a try! I love this combination. The cranberries add so much. Thanks, it really is a great combo!